It’s your mother’s 80th birthday party and your four-year old refuses to go unless she’s allowed to wear her old, dirty sneakers and favorite jeans. The pretty party dress you spent a fortune on is lying in a heap on her bedroom floor. She looks at you with that all-too-familiar “see what I can do” glint in her eye. Her chin is defiantly thrust forward; her feet are firmly glued to the ground. Mount Everest. She is waiting to see if you will dare to scale her heights or recede into the cowardly shadows of bribes or, better still, will you fall on your knees and plead? You feel your anger churning and unthinkable fantasies of “really-showing-her-who-is-boss” flash through your mind. Your voice rises. She cries and flails. You yell louder. She stomps and kicks. An hour has passed. She wins. She wears the sneakers and jeans to the party. You have aged five years. Conflicts with our children are inevitable. In fact, they can even be healthy – provided we can learn how to transform them into life-lessons. At the core, conflict is created when there is a battle of wills: your way or the highway; this or that; either-or; now or never. It is when we engage in dualistic, rigid thinking that we find ourselves in a battle for power and control. The first step to finding transcendence in a conflict is to examine one’s own dualistic thinking and the unconscious ways we fight for control. Conflicts arise simply because of a desire in both parties to assert their will and a corresponding inability to let go of the need to “win,” dominate, or control, the other. Children have an instinctual egocentricity which makes them obsessive about “winning,” therefore it is up to us, as parents, to teach them to transform this instinctual desire into “higher-order wisdom.” We can do this through our approach to conflict. Conflict need not be about winning or losing. Our entire notion of conflict can be turned on its head, but only if we are willing to look within ourselves and examine the often incessant and mindless quest for control we have as parents. Let’s look at conflict in a different way: Conflict can be a valuable conduit for “give and take,” negotiation, and learning the art of losing and compromising. Your four-old can be taught, right there in the moment, that this is not a “me versus you” situation, but instead a “we are in this together and we need to find a creative solution that works for us both” situation. But to do this, you the parent must first detach from the desire to “win” and have it “your way or no way.” So perhaps the dress is worn, but with the sneakers instead of the dress-up shoes. Or perhaps, the dress is worn, but she is promised that she gets to choose the outfit the next time. Or perhaps you let go of your need to have her look a certain way altogether and let her wear what she wants, because after all, it is all mainly your ego that is in the way – your ego-desire to have your child look or act like a “doll” because heaven forbid, “what will the relatives think?” Regardless, this stale mate can be transformed into a rich dialogue and abundant opportunity for practicing the art of compromise. Of course, there are some situations where there can be no compromise, such as safety and respect for self and others, but for the most part, the rest of the conflicts we engage in are all about our parental (massive) egos. Our desires to “appear” a certain way to the outside world. Conflict offers timeless life-lessons both for parent and child. Lessons that teach our children: “Yes, you can indeed assert your will, and you will not be punished for it, but at the very same time, you will learn how to accept and absorb another’s will.” And we parents learn to examine our own egos and detach from our quest for mindless control. Parenting is a two-way transformation indeed! If we, as parents, can practice and then teach the dance of balancing the “I” and the “We” then we will have truly taught our children one of life’s hardest lessons. If we can view conflict as a way to experience the “art of losing,” the beauty of creating compromise and the fool-hardiness of living in a rigid world of “either-or,” then we can teach our children to live life as it truly is: messy, full of complex and competing demands, and rich with unpredictability. We will teach them that “winning” at life is all about finding creative solutions, being flexible, and learning to negotiate with an intimate other. This post came at the perfect time. My 3 1/2 year old has been waging a war against going to pre school every morning for the past few weeks. This morning it hit an all time high. I’ve asked her why she doesn’t want to go to school, is it her teachers, is it the nap? Her answer is simply she wants to stay home with me. I would love her to stay home too but I have 10 month old twins and also run a business from home. She doesn’t understand Mommy is working like Daddy too (except I am not leaving the house). How can I avoid the tantrums and get her out the door to school in the morning? This morning was absolutely heart breaking to watch. 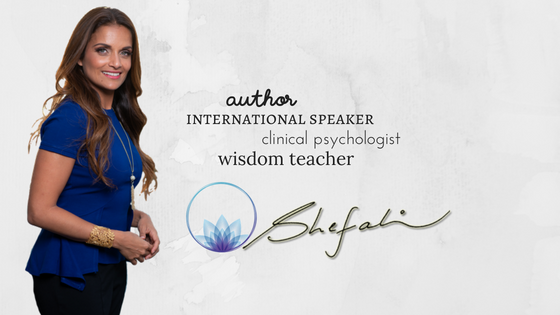 Thanks for all you do Dr. Shefali. You’re an inspiration! Thank you Dr. Shefali. I have a 10 year old daughter and your words help me tremendously. I am learning to be a more patient mom, professional and wife! Wishing you and your loved ones a happy and healthy Thanksgiving! ❤️? Good day! This is my 1st comment here so I just wanted to give a quick shout out and say I truly enjoy reading your articles. Can you suggest any other blogs/websites/forums that deal with the same topics? Appreciate it! Dr Shefali i am big fan of you this is my 1st comment here, Thanks for all you write and explain Dr. Shefali. You’re an inspiration!